The walls of the boutique are covered with a unique clothes and accessories not exactly typical in this part of North Carolina. Think boho, tomboyish style instead of monogram-filled, Southern prep. The boutique’s colorful decorations make the place even more inviting. When I walk in, the owner, Emma Blaney, is helping an elderly customer with her purchase. Emma smiles as she discusses her boutique and chats with the woman. Emma makes sure she can see the cash register and entrance from where we sit down for the interview. She wants to make sure she can help anyone who comes into the shop because she is working alone for the day. Even though she still had a seven-hour workday ahead of her, Emma’s voice is full of enthusiasm and she instantly makes the room more comfortable for the interview. 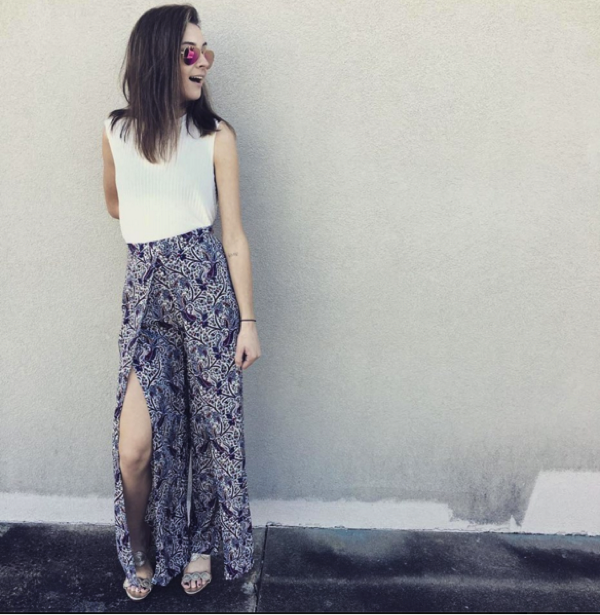 Emma Blaney is starting a new trend with her boutique, implementing her own style into a predominately Southern fashion culture. She grew up around a car racing family but somehow found a love for fashion and created her own, distinctive style. 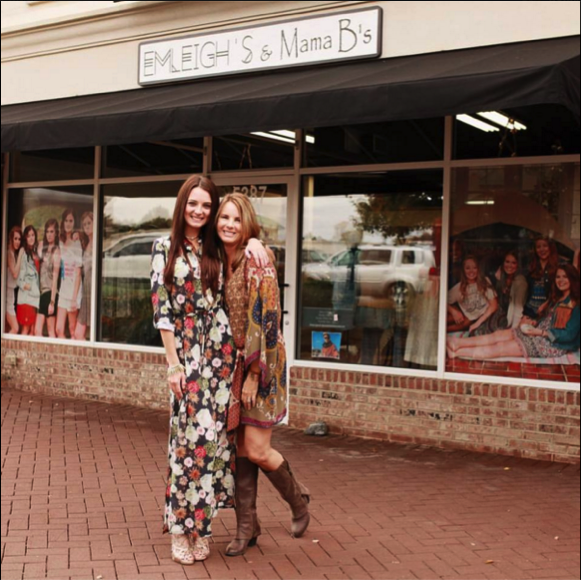 A former University of North Carolina at Charlotte student, Emma created EmLeigh’s and Mama B’s when she realized owning a boutique was her dream. Launching her own venture has been a long process, but along the way she has had the support of her family, friends and boyfriend. Emma, who grew up around car racing, is not the type of person you think would own her own boutique. Her father Dave Blaney is a famous sprint car driver who also ventured into NASCAR in his career. He had all three of his children race quarter midgets, which are small dirt track cars. Only Emma and her younger brother Ryan made a hobby out of it, though. They spent weekends racing at a track in Salisbury, and Emma admits she enjoyed the experience while it lasted. But as it became more serious, Emma realized she did not want to continue racing as a hobby. She also began to model by the time she was in eighth grade. Modeling pulled her into the fashion world, opening her eyes to many different fashions. Ironically, she started to fall in love more with the clothes than the actual modeling. Emma played volleyball and basketball at Bishop McGuiness High School, which was a private Catholic school in Kernersville, N.C. Even so, she never left the racing world completely. She still went to races on weekends and supported Ryan whenever he competed. Racing was something that was always going to be a part of her life because of her family. During her freshman year of high school, she began to dream of opening up her own clothing store. She admits she had many dreams during high school, but the idea of starting a boutique came back year after year. Emma was not able to begin right away, though. When she graduated from Bishop McGuiness, she went to the University of North Carolina at Charlotte. She only stayed at UNC-Charlotte for a year, but she had already learned to run a business from her experience working at Wicked Purple, a boutique in High Point, in her junior year of high school. While Emma enjoyed her time at Wicked Purple, she always knew she would pursue her own boutique one day. So, it was not long until she created her own little boutique. After her time at Wicked Purple, Emma started to create her store. This was an idea Emma made sure to prepare well for before presenting it to her parents. She created a booklet about how she was going to start her venture and gave many details to prove she could do it. All of Emma’s hard work paid off when her parents agreed to support her on her new journey. EmLeigh’s and Mama B’s was originally created as an online store and gained popularity that way first. While there was not an actual boutique location at the time, Emma would occasionally set up shop in another boutique, host an event at her parents’ home or have a trunk show. She knew she would eventually want to get an actual building, but she was content with the success of the online store. Soon Emma’s mother wanted to pitch in and helped Emma purchase the store on Village Drive in Concord. As far as the clothes she sells, Emma says she would wear everything in her store herself. She wanted to bring her own tomboyish, bohemian style to Concord. Emma went against some of the advice from her younger sister to buy what would sell, instead buying items she would wear herself. Emma even models the clothes for the boutique’s Instagram account. Emma has had the support of her entire family through the whole process. Her family encouraged her from day one, and she surely has not forgotten that. Anyone can tell by how she talks about her family that she is thankful for them and loves them wholeheartedly. Her mom became involved in the store and often goes to a clothing market in Atlanta with Emma and Erin. Meanwhile, Emma’s father gave her the encouragement to keep going and never give up. Emma is thankful for her father and brother’s popularity as well. Both are household names for racing fans, so being in Concord, which is a center for racing, helps Emma out. She knows their popularity was not what made the store sought-after, but she acknowledges that it helped. With all his female fans, Ryan has the power to post something about the store and get Emma a bunch of new followers. Emma is thankful for this support and sees having her dad and brother there to back her as a bonus. She also looks to her brother and sister every day for inspiration to move toward her goal and live up to the pressures. 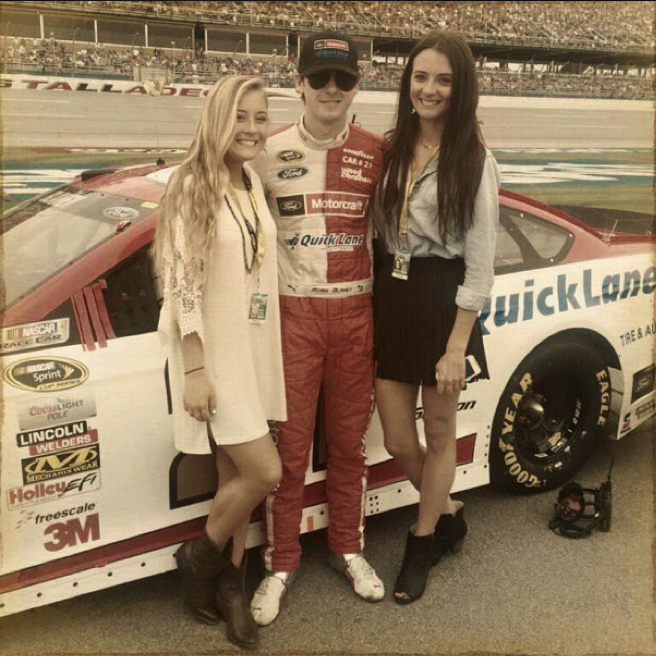 Ryan is the new racecar driver in the family and is currently driving in the premier series of the NASCAR. Erin is currently a first-year at the University of Alabama. Emma admires how her brother has matured with the pressure he feels as a rookie and that her little sister was brave enough to go to Alabama without knowing anyone there. “They’re not scared, and that gives me inspiration,” Emma says. Emma’s boyfriend Cale Conley, who is also a racecar driver, has supported her as well. The two have been dating on and off for about seven years, and Emma’s face lights up when she mentions him. 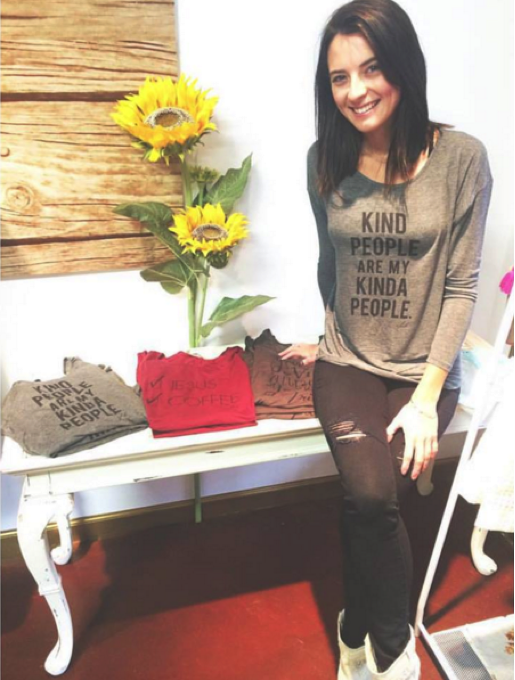 Cale has been with her through the ups and downs of the boutique’s creation and has been positive the entire time. “I have become a more positive person because of him,” Emma says, explaining that while she was not necessarily negative, she could get down easily before she had Cale. He pushes her to be happy and optimistic every day. I like this-Great to read, but I don’t know where to start. Which of your posts can you recommend I read next? Hi, i feel that i noticed you visited my blog so i came to “return the favor”.I’m trying to find issues to enhance my website!I suppose its adequate to make use of a few of your concepts!! some genuinely grand work on behalf of the owner of this web site, absolutely great subject material. Hi, just came across this web page. Its a great illustration of how small to medium sized companies can use Awards based marketing to get their companies recognised on the 1st page of Google. Awards programmes offer many benefits to participants. After all they bring publicity and you can share the news of your win with your employees, clients, industry peers and target market as many times as you like. Additonally awards offer prestige and status, giving potential prospects peace of mind that they are working with a reputable company. There are many types of awards programmes, including those that host awards ceremonies (and you pay per table), organisations that award only their members (and you pay for membership and advertising) and those that provide promotional materials. The latter is a great choice for those who are wary about the benefits of using corporate awards programmes because generally nominees and winners do not have to pay a penny to be considered. Participants often receives online recognition, usually with a reach much greater than their own marketing efforts can deliver. Other free benefits can include the use of an announcement. Most participants have the option to purchase additional marketing materials to further enhance their win, if they wish to, for use in social media campaigns, on their own website, email marketing campaigns or in customer newsletters. I just want to mention I am just beginner to blogging and truly enjoyed this blog site. Most likely I’m going to bookmark your site . You definitely have fantastic posts. Thanks for revealing your web page. You really make it seem so easy with your presentation but I find this matter to be actually something which I think I would never understand. It seems too complex and extremely broad for me. I’m looking forward for your next post, I?ll try to get the hang of it! It is appropriate time to make some plans for the long run and it’s time to be happy. I have read this submit and if I may I desire to recommend you few fascinating things or suggestions. Perhaps you can write next articles regarding this article. I wish to learn more issues approximately it! I have some other reasons that support your writing. If I may? magnificent points altogether, you just gained a logo new reader. What might you recommend about your post that you just made a few days in the past? Any sure? Heya i’m for the first time here. I came across this board and I in finding It really useful & it helped me out a lot. I’m hoping to provide one thing back and aid others such as you aided me. Very efficiently written story. It will be beneficial to anybody who usess it, as well as yours truly :). Keep up the good work – i will definitely read more posts. Excellent goods from you, man. I’ve understand your stuff previous to and you’re just extremely fantastic. I actually like what you have acquired here, certainly like what you’re saying and the way in which you say it. You make it entertaining and you still take care of to keep it wise. I cant wait to read far more from you. This is actually a great site. I will right away seize your rss feed as I can’t find your e-mail subscription link or e-newsletter service. Do you have any? Please let me know in order that I could subscribe. Thanks. I would like to thank you for the efforts you’ve put in writing this web site. I’m hoping the same high-grade website post from you in the upcoming as well. In fact your creative writing skills has encouraged me to get my own website now. Really the blogging is spreading its wings rapidly. Your write up is a good example of it. Great amazing issues here. I¡¦m very glad to see your post. Thank you a lot and i’m having a look forward to contact you. Will you please drop me a e-mail? I definitely wanted to write a brief remark to appreciate you for those great concepts you are writing at this website. My extensive internet search has at the end been compensated with pleasant tips to share with my family and friends. I ‘d say that most of us website visitors actually are undoubtedly blessed to live in a very good community with so many wonderful people with valuable points. I feel very much privileged to have used your webpages and look forward to some more exciting moments reading here. Thank you once more for everything. Normally I do not read article on blogs, however I would like to say that this write-up very forced me to check out and do so! Your writing taste has been amazed me. Thank you, very nice post. I would like to thank you for the efforts you have put in writing this site. I’m hoping the same high-grade web site post from you in the upcoming as well. In fact your creative writing abilities has inspired me to get my own website now. Actually the blogging is spreading its wings fast. Your write up is a good example of it. Simply desire to say your article is as amazing. The clarity in your post is simply spectacular and i could assume you’re an expert on this subject. Fine with your permission let me to grab your RSS feed to keep up to date with forthcoming post. Thanks a million and please carry on the enjoyable work. Thank you a lot for providing individuals with remarkably wonderful chance to read critical reviews from this site. It really is so enjoyable plus stuffed with a lot of fun for me personally and my office colleagues to visit your website at least 3 times in one week to find out the new secrets you have got. Of course, I am usually satisfied with all the effective information served by you. Some two areas on this page are rather the simplest I’ve had. Hi, Neat post. There is a problem with your site in web explorer, might check this¡K IE still is the marketplace leader and a large component to people will leave out your fantastic writing because of this problem. Somebody essentially assist to make severely posts I would state. This is the very first time I frequented your website page and up to now? I amazed with the research you made to make this actual put up incredible. Fantastic job! I must show my thanks to this writer for rescuing me from such a situation. Right after researching throughout the world wide web and getting tricks which are not helpful, I was thinking my entire life was well over. Existing without the presence of strategies to the issues you have sorted out through this blog post is a serious case, as well as ones that might have badly affected my entire career if I had not come across your web page. Your primary know-how and kindness in playing with a lot of things was excellent. I don’t know what I would have done if I had not discovered such a point like this. I can also at this time relish my future. Thanks so much for this impressive and effective guide. I will not think twice to suggest your web blog to anyone who requires guidelines on this topic. It is appropriate time to make some plans for the future and it is time to be happy. I’ve read this publish and if I could I wish to recommend you some fascinating things or tips. Perhaps you can write next articles referring to this article. I want to learn even more things about it! hey there and thank you for your info – I have certainly picked up anything new from right here. I did however expertise several technical issues using this site, as I experienced to reload the website a lot of times previous to I could get it to load correctly. I had been wondering if your web hosting is OK? Not that I am complaining, but sluggish loading instances times will sometimes affect your placement in google and can damage your quality score if ads and marketing with Adwords. Well I am adding this RSS to my email and could look out for much more of your respective interesting content. Make sure you update this again soon..
magnificent publish, very informative. I ponder why the other experts of this sector do not understand this. You must continue your writing. I’m confident, you’ve a huge readers’ base already! I just want to mention I’m newbie to blogging and definitely enjoyed you’re website. Probably I’m planning to bookmark your site . You certainly come with outstanding articles and reviews. Appreciate it for sharing your webpage. fantastic points altogether, you simply received a new reader. What may you suggest about your publish that you made some days in the past? Any positive? Great post. I was checking constantly this blog and I am impressed! Extremely helpful info specially the last part 🙂 I care for such information much. I was looking for this certain information for a very long time. Thank you and good luck. What i do not realize is in truth how you’re now not actually a lot more well-appreciated than you may be now. You’re so intelligent. You realize thus significantly with regards to this subject, produced me for my part imagine it from a lot of numerous angles. Its like men and women don’t seem to be involved except it is one thing to do with Lady gaga! Your own stuffs outstanding. All the time deal with it up! My wife and i ended up being cheerful Jordan could deal with his investigation using the precious recommendations he came across while using the web pages. It’s not at all simplistic just to happen to be freely giving instructions which often others could have been selling. We really fully grasp we’ve got you to give thanks to for that. All of the explanations you made, the straightforward web site navigation, the relationships you make it possible to engender – it’s mostly impressive, and it’s really assisting our son and us reckon that this situation is enjoyable, and that is really important. Thank you for the whole thing! Whats Happening i’m new to this, I stumbled upon this I’ve discovered It positively helpful and it has aided me out loads. I’m hoping to give a contribution & aid different users like its helped me. Great job. Simply desire to say your article is as surprising. The clearness in your post is simply excellent and i can assume you’re an expert on this subject. Well with your permission let me to grab your feed to keep up to date with forthcoming post. Thanks a million and please keep up the rewarding work. I definitely wanted to make a quick comment to be able to appreciate you for these splendid information you are giving at this site. My time consuming internet search has at the end been honored with awesome insight to write about with my family members. I ‘d suppose that many of us site visitors actually are quite lucky to exist in a remarkable place with very many perfect people with very helpful principles. I feel very happy to have encountered the site and look forward to many more amazing minutes reading here. Thanks a lot again for a lot of things. A lot of thanks for your entire efforts on this website. My niece really likes going through internet research and it is simple to grasp why. All of us know all of the dynamic way you give worthwhile guides via the blog and as well as boost participation from other individuals on the topic so our favorite child is really learning so much. Have fun with the remaining portion of the year. You have been conducting a dazzling job. You actually make it seem really easy together with your presentation however I to find this topic to be really something that I think I’d never understand. It sort of feels too complex and extremely wide for me. I’m looking ahead to your next put up, I will try to get the grasp of it! You actually make it seem so easy together with your presentation but I to find this topic to be really one thing which I believe I’d never understand. It seems too complicated and very wide for me. I am looking forward for your subsequent submit, I will try to get the cling of it! Next time I read a blog, I hope that it won’t disappoint me as much as this one. I mean, I know it was my choice to read, but I genuinely thought you’d have something helpful to talk about. All I hear is a bunch of complaining about something you could fix if you weren’t too busy searching for attention. naturally like your web site however you have to test the spelling on several of your posts. Many of them are rife with spelling issues and I find it very troublesome to tell the truth however I will definitely come back again. Great awesome things here. I am very happy to look your article. Thanks so much and i am having a look ahead to contact you. Will you kindly drop me a e-mail? I’ve been surfing online greater than 3 hours lately, yet I never found any attention-grabbing article like yours. It is pretty price sufficient for me. Personally, if all site owners and bloggers made excellent content material as you probably did, the internet shall be a lot more useful than ever before. Thank you a lot for giving everyone such a spectacular chance to discover important secrets from this web site. It is usually so good and also jam-packed with a good time for me personally and my office friends to search your site at a minimum three times weekly to find out the newest secrets you have. And of course, I am also actually pleased concerning the awesome thoughts you give. Selected 4 facts in this post are essentially the most impressive I’ve ever had. I do agree with all of the ideas you have introduced on your post. They are really convincing and can definitely work. Still, the posts are very brief for beginners. Could you please lengthen them a bit from next time? Thank you for the post. certainly like your website however you have to test the spelling on several of your posts. A number of them are rife with spelling issues and I in finding it very bothersome to tell the truth however I will surely come back again. You really make it appear so easy together with your presentation but I to find this topic to be really something which I feel I’d never understand. It seems too complex and extremely broad for me. I am taking a look forward to your next post, I will attempt to get the hang of it! Thanks for any other informative blog. Where else may just I am getting that kind of information written in such a perfect approach? I’ve a mission that I am simply now operating on, and I have been on the look out for such info. I precisely desired to appreciate you once more. I do not know the things I would have created without these information shown by you relating to such concern. It had become the horrifying case in my view, however , witnessing a specialised technique you processed the issue made me to weep for fulfillment. Now i’m grateful for the work and then expect you comprehend what a great job you are providing instructing most people all through your web site. Most likely you haven’t got to know any of us. Thank you, I have just been searching for information approximately this subject for a long time and yours is the best I have found out till now. However, what in regards to the bottom line? Are you certain concerning the supply? I like what you guys tend to be up too. Such clever work and coverage! Keep up the good works guys I’ve included you guys to my personal blogroll. Simply desire to say your article is as astounding. The clarity in your post is simply cool and i can assume you’re an expert on this subject. Well with your permission allow me to grab your feed to keep updated with forthcoming post. Thanks a million and please keep up the gratifying work. I’m impressed, I need to say. Actually hardly ever do I encounter a weblog that’s each educative and entertaining, and let me tell you, you’ve got hit the nail on the head. Your concept is outstanding; the difficulty is something that not enough persons are talking intelligently about. I am very blissful that I stumbled throughout this in my search for something referring to this. I¡¦ve been exploring for a bit for any high quality articles or blog posts on this sort of area . Exploring in Yahoo I ultimately stumbled upon this web site. Studying this information So i am satisfied to convey that I have an incredibly just right uncanny feeling I discovered just what I needed. I so much surely will make sure to do not disregard this website and provides it a glance regularly. I do consider all of the concepts you’ve presented on your post. They are really convincing and can certainly work. Nonetheless, the posts are very quick for newbies. May you please extend them a bit from next time? Thanks for the post. You completed several fine points there. I did a search on the theme and found nearly all folks will consent with your blog. I truly wanted to jot down a brief remark to be able to appreciate you for these splendid recommendations you are giving out at this site. My time intensive internet investigation has finally been rewarded with really good details to write about with my colleagues. I ‘d repeat that many of us readers are truly blessed to exist in a notable website with so many outstanding professionals with very beneficial secrets. I feel pretty privileged to have discovered the webpages and look forward to tons of more excellent times reading here. Thanks once again for all the details. I am also commenting to let you know what a beneficial encounter my wife’s girl gained checking the blog. She learned lots of issues, including what it is like to possess an excellent giving heart to have a number of people without hassle understand selected problematic topics. You undoubtedly did more than people’s expected results. I appreciate you for coming up with such good, safe, revealing and even unique tips about this topic to Jane. Generally I don’t learn post on blogs, however I wish to say that this write-up very compelled me to try and do so! Your writing style has been amazed me. Thank you, very nice article. I would like to thank you for the efforts you have put in writing this website. I’m hoping the same high-grade web site post from you in the upcoming as well. Actually your creative writing abilities has encouraged me to get my own website now. Really the blogging is spreading its wings rapidly. Your write up is a good example of it. My spouse and I absolutely love your blog and find nearly all of your post’s to be just what I’m looking for. Does one offer guest writers to write content in your case? I wouldn’t mind producing a post or elaborating on a few of the subjects you write in relation to here. Again, awesome site! I do accept as true with all of the ideas you’ve introduced on your post. They’re really convincing and will certainly work. Nonetheless, the posts are too short for novices. May you please prolong them a bit from next time? Thanks for the post. Thanks so much for giving everyone an extremely terrific possiblity to read in detail from here. It’s always very brilliant and full of a good time for me personally and my office peers to search your site really 3 times per week to learn the new things you have got. And lastly, I’m also actually satisfied with all the perfect techniques served by you. Selected 3 facts in this posting are unequivocally the best we have all ever had. I’m still learning from you, as I’m trying to reach my goals. I absolutely love reading everything that is written on your site.Keep the posts coming. I liked it! Great ¡V I should definitely pronounce, impressed with your web site. I had no trouble navigating through all the tabs and related info ended up being truly easy to do to access. I recently found what I hoped for before you know it at all. Reasonably unusual. Is likely to appreciate it for those who add forums or anything, website theme . a tones way for your customer to communicate. Excellent task.. Thanks for the recommendations you have shared here. Yet another thing I would like to talk about is that pc memory needs generally increase along with other advances in the technological innovation. For instance, when new generations of processors are brought to the market, there is usually a corresponding increase in the size preferences of both the laptop memory along with hard drive space. This is because the software operated by way of these processors will inevitably boost in power to benefit from the new technological know-how. After checking out a number of the blog articles on your web site, I seriously like your way of blogging. I added it to my bookmark website list and will be checking back in the near future. Take a look at my website too and tell me what you think. Hello very cool site!! Man .. Excellent .. Wonderful .. I’ll bookmark your website and take the feeds also¡KI’m satisfied to seek out so many helpful information right here in the post, we want develop more techniques in this regard, thank you for sharing. . . . . .
wonderful points altogether, you just gained a new reader. What may you suggest about your publish that you made some days in the past? Any certain? hey there and thank you for your info – I’ve certainly picked up anything new from right here. I did however expertise a few technical points using this website, since I experienced to reload the web site a lot of times previous to I could get it to load properly. I had been wondering if your web host is OK? Not that I’m complaining, but slow loading instances times will sometimes affect your placement in google and could damage your high-quality score if ads and marketing with Adwords. Anyway I am adding this RSS to my e-mail and can look out for a lot more of your respective exciting content. Make sure you update this again soon..
I¡¦m not positive the place you’re getting your info, but good topic. I must spend some time studying much more or working out more. Thanks for magnificent information I was in search of this info for my mission. Thanks for any other great article. Where else could anybody get that kind of info in such an ideal approach of writing? I have a presentation subsequent week, and I’m on the search for such info. I¡¦m not sure where you’re getting your info, however great topic. I needs to spend a while studying much more or figuring out more. Thank you for excellent info I was on the lookout for this information for my mission. I¡¦ve been exploring for a bit for any high-quality articles or weblog posts in this kind of space . Exploring in Yahoo I at last stumbled upon this web site. Studying this info So i¡¦m satisfied to exhibit that I have an incredibly just right uncanny feeling I came upon exactly what I needed. I most definitely will make sure to don¡¦t overlook this website and give it a look regularly. I would like to thnkx for the efforts you’ve put in writing this blog. I’m hoping the same high-grade web site post from you in the upcoming also. Actually your creative writing skills has encouraged me to get my own site now. Actually the blogging is spreading its wings fast. Your write up is a good example of it. Thanks , I’ve recently been searching for info approximately this subject for ages and yours is the greatest I have found out till now. But, what concerning the conclusion? Are you certain in regards to the supply? great put up, very informative. I ponder why the opposite specialists of this sector do not understand this. You must continue your writing. I am sure, you’ve a great readers’ base already! Thanks so much for giving everyone a very wonderful chance to read from this site. It is usually so beneficial and as well , full of a great time for me and my office peers to search your site at least 3 times weekly to find out the new items you have got. And definitely, I am just at all times happy with all the powerful principles you give. Some two facts on this page are definitely the most beneficial we have ever had. Someone essentially lend a hand to make seriously articles I would state. This is the very first time I frequented your website page and thus far? I amazed with the research you made to create this particular post extraordinary. Fantastic process! Thanks , I have recently been looking for information about this topic for a long time and yours is the best I’ve came upon till now. But, what about the conclusion? Are you sure in regards to the supply? You really make it seem so easy along with your presentation however I to find this topic to be actually one thing which I think I would never understand. It kind of feels too complex and extremely vast for me. I’m looking ahead in your next submit, I¡¦ll attempt to get the grasp of it! Can I simply say what a comfort to find somebody that really knows what they are discussing over the internet. You certainly realize how to bring an issue to light and make it important. More people should look at this and understand this side of the story. I was surprised you’re not more popular given that you certainly possess the gift. Excellent post. I was checking continuously this blog and I’m impressed! Extremely useful information specially the last part 🙂 I care for such information much. I was seeking this certain information for a long time. Thank you and good luck. I¡¦m not positive the place you’re getting your information, however good topic. I must spend a while finding out much more or working out more. Thanks for magnificent information I used to be searching for this info for my mission. I have been surfing on-line more than three hours lately, yet I never found any fascinating article like yours. It¡¦s pretty value sufficient for me. In my opinion, if all site owners and bloggers made excellent content material as you probably did, the net will likely be a lot more useful than ever before. Very well written information. It will be valuable to everyone who usess it, as well as me. Keep doing what you are doing – i will definitely read more posts. Almost all of whatever you mention is astonishingly appropriate and that makes me ponder the reason why I hadn’t looked at this with this light previously. Your article truly did turn the light on for me personally as far as this specific topic goes. Nevertheless there is just one position I am not necessarily too comfortable with and while I try to reconcile that with the central theme of the issue, allow me observe just what the rest of your visitors have to point out.Well done. I simply want to say I’m all new to weblog and seriously loved this blog. Most likely I’m want to bookmark your blog . You really have incredible well written articles. Many thanks for revealing your blog. Thanks for every other fantastic article. Where else could anyone get that type of information in such a perfect manner of writing? I’ve a presentation subsequent week, and I am on the look for such information. I actually wanted to send a quick remark to be able to say thanks to you for some of the fantastic items you are placing on this website. My prolonged internet lookup has now been compensated with good tips to share with my visitors. I ‘d admit that we site visitors actually are unquestionably endowed to exist in a wonderful place with many outstanding professionals with beneficial solutions. I feel truly fortunate to have encountered your web pages and look forward to some more exciting times reading here. Thanks a lot again for a lot of things. Hiya, I’m really glad I’ve found this information. Nowadays bloggers publish only about gossips and net and this is actually frustrating. A good site with exciting content, that is what I need. Thank you for keeping this site, I’ll be visiting it. Do you do newsletters? Can’t find it. Hi my friend! I wish to say that this article is awesome, nice written and include approximately all significant infos. I would like to look extra posts like this . I am only writing to make you know of the outstanding encounter my girl experienced checking your blog. She figured out a lot of issues, with the inclusion of how it is like to have an incredible coaching spirit to have men and women without problems have an understanding of selected complex matters. You really surpassed our own expectations. Thank you for coming up with the important, healthy, informative and also easy thoughts on this topic to Ethel. Wow, awesome weblog format! How long have you ever been running a blog for? you make running a blog look easy. The total glance of your web site is excellent, as neatly as the content! I’m still learning from you, as I’m improving myself. I definitely love reading everything that is posted on your blog.Keep the tips coming. I enjoyed it! After looking into a handful of the blog articles on your website, I honestly appreciate your technique of blogging. I bookmarked it to my bookmark webpage list and will be checking back soon. Take a look at my website as well and tell me how you feel.